Waist: 61 cm, Hips: 85 cm. All things are cool factory quality. Very fast shipping. As always, excellent quality! Loved this top, beautiful. The same description. It looks pretty, good quality. Delivery two weeks by courier to the house. Track number tracked. 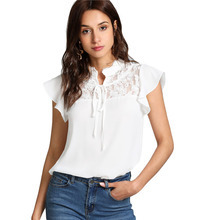 Blouse fully corresponds to the description and size grid. Happy with the purchase. Thanks to the store. The blouse is very beautiful! It fits the description and picture! The Seller is very friendly and outgoing. Track to track. My daughter is S (height 155, weight 47), ordered XS-at the time! Delivered in Moldova 3 weeks! Thank You very much!!! RECOMMEND! Excellent quality. Very happy with the purchase. 100% recommended. Take to school. Like the blouse, material and style. Decoration of lace high quality. Thank you very much. Want to order similar yet. Fantastic! Just like in picture. I recommend. It cute. A little bit see through so you have to wear something underneath.